The repercussions of Grimm Fairy Tales #100 are still being felt. The Dark Queen's actions have affected everyone in the Grimm Universe. All of the realms have been merged, even the Inferno where Lucifer reigns supreme...or at least she did. Now she's fighting the Dark Horde to hold on to her territory. You'd think this would be easier considering the Dark Queen is her step-mom, but no such luck. Fortunately, she has her very own assassin named Mercy by her side, but will that be enough to stop the never-ending flow of monsters looking to tear her apart? Inferno: Rings of Hell picks up in the midst of a heated battle between Lucifer's forces and the Dark Horde. It's a knock-down, drag-out fight as the two groups collide. Blood and body parts are flying everywhere. Despite having the power of Hell at her disposal, Lucifer is barely holding on. She puts on a good show, but things are looking bleak. 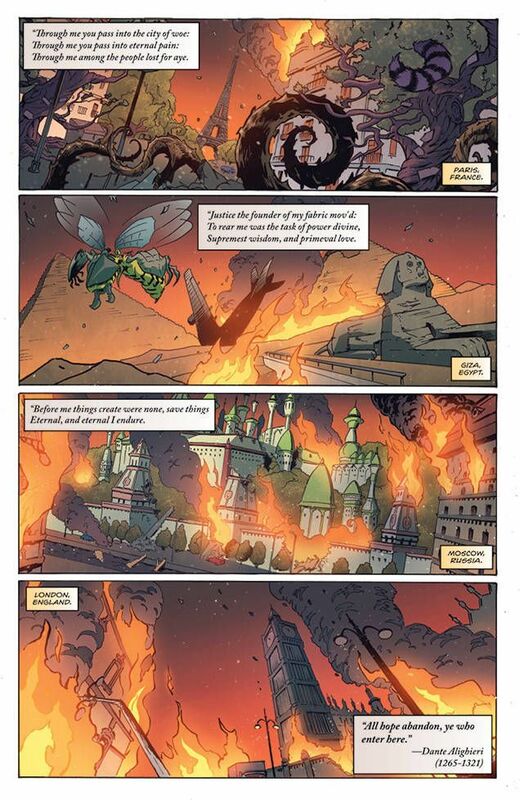 This mini-series is a direct continuation to the Inferno: Age of Darkness one-shot. The Dark Queen is still pissed about how Lucifer betrayed her and aims to make her step-daughter suffer. This issue sets up a gauntlet Lucifer and Mercy must go through if they have any hope of surviving this new status quo. It's an interesting move and it puts Inferno's ruler in a position that she's not used to: powerless. The dynamic between Lucifer and Mercy is one of deep trust. Mercy sold her soul a while back in exchange for freeing her sister from Hell. Now she serves as Lucifer's personal assassin. This may be the one story where someone makes a deal with the devil and is actually OK with it. Mercy likes her job and she does it well. The Dark Horde is just another target and Lucifer has her back on the battlefield. Fernando Argosino can draw one helluva fight. 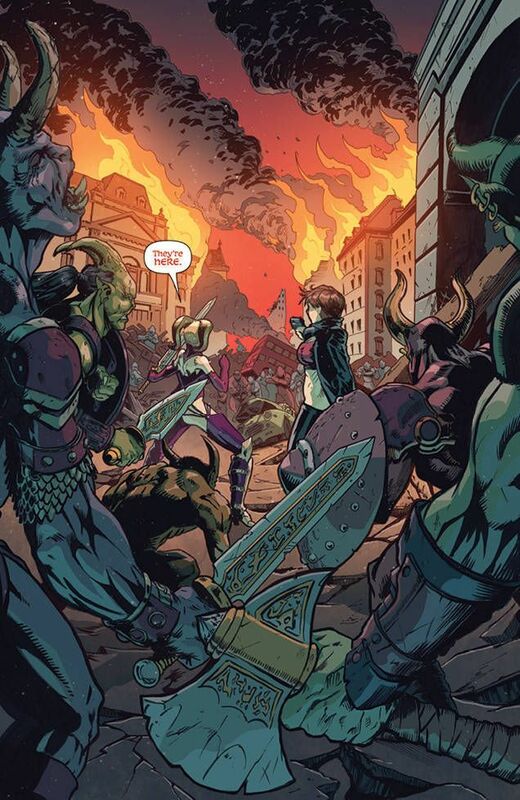 The opening pages can barely contain the chaos and destruction as these two forces clash in a ruined city. The action moves quickly, but it is never confusing or hard to follow. This isn't like a modern day action movie where there are a bunch of fast cuts so you can't understand on what's going on. Instead, Argosino focuses on the key points of the battle, showcasing Lucifer and Mercy as they tear through their enemies in increasingly elaborate ways. 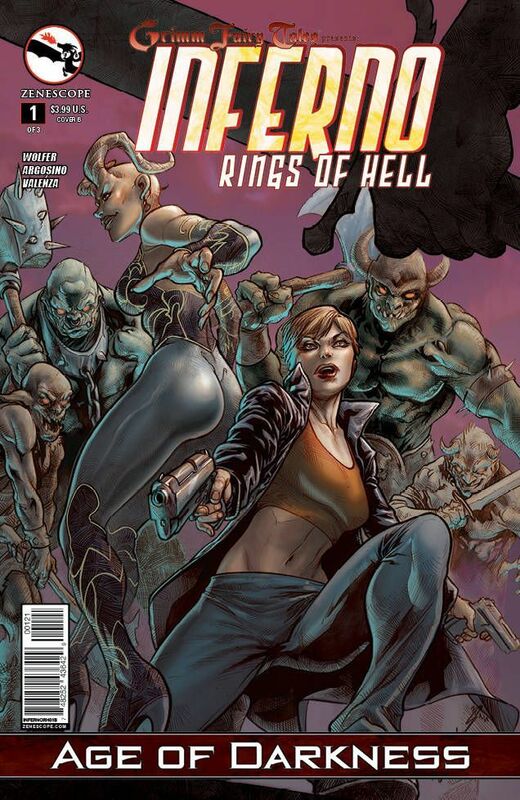 This first issue of Inferno: Rings of Hell is largely setup for the rest of the mini-series. It sets everything in motion for the events to come that will challenge Lucifer and Mercy with the fate of the Inferno itself at stake. If you thought that the Age of Darkness couldn't get any more epic, just wait until you read this issue. Every corner of the Grimm Universe is affected and from the looks of things, many of its residents won't make it out alive.